Finally a backpack for every occasion! 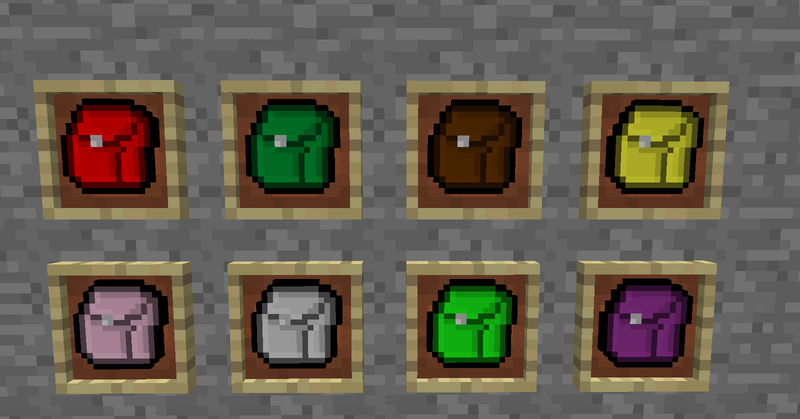 This mod is an addon for Forestry, and adds a bunch of new backpacks, each on crafted just like the vanilla forestry ones. Logistical Engineer's Backpack - Holds anything relating to item transport, from hoppers, rails and carts to Buildcraft Pipes. Electrician's Backpack - Holds anything related to energy or power, from MJ to EU. Special Item: If IC2 is installed it will be copper cables, if Buildcraft it will be gold power pipes and if neither it will be redstone dust. You MUST have Forestry installed first: Get Forestry Here. Just toss the More Backpacks.jar into your mods folder. In the config you can easily enable or disable any backpacks you like, and change the item ID's if necessary. If you want to configure the items a backpack holds, go into the config folder located in config/redgear/morebackpacks. Inside you'll find a series of .json files for each backpack. Open the one you want to edit with a text editor. There are only two values in these files. The first value; backpackKey, is the name of the backpack. The second value; items, is a list of approved items using the new 1.7 item registration system. You can find the values for these in the fml-client logs. The syntax for these entries is "modId:itemName@meta" where "@meta" is optional and leaving it empty will allow any meta value. Save and restart minecraft to see your changes effects. Deleting one of these files will replace it with the default. What Happens when two backpacks hold the same thing? Forestry already handles this, since it is possible to have two of the same backpack. What happens is first it will look at your hot bar, and fill any backpacks from left to right. So if your hot bar has a miners and a redstone backpack, it will put any redstone into the left-most. If your hot bar has no backpack space, it will go to the top row of your inventory and fill from left to right, and then down to the next row and so on. Hopefully this picture will help make it clearer. are caused by More Backpacks using an outdated Forestry API. It's a shame that this mod doesn't have an issue tracker somewhere. I will just have to put my crash log here and hope that someone stumbles into it eventually. I have not tried to duplicate this problem with just chemcraft core, this mod and thaumcraft, but if it is decided that something else caused this crash then I will try it without any other mods. If the rest of the log is needed, I will upload it to some pasted-data hosting site, but I won't bother unless that becomes necessary only after someone has stumbled upon this. This happens (not sure on java part, but) cause on Linux (e.g. non-windows) filenames are treated case-sensitive, e.g. RedGear (which is being searched) & redgear (which actually exist) are same file. I am having the same issue, has a fix been found yet? That picture was taken for the Minecraft Forums, so that's why it's so large.